With a new year we are brought many a new prospects for our entertainment purposes and in looking forward to 2019 one thing is more than clear and that is the fact audiences will have an abundance of interesting material to choose from. In setting out to make a most anticipated list I actually began with some fifty-something films I found interesting or knew I'd care to see based solely on surface factors such as director, cast members, or synopsis. It pains me that movies like John Crowley's follow-up to Brooklyn, Goldfinch, won't get acknowledged here nor will James Mangold's Ford v. Ferrari, Danny Boyle's Beatles project, or Joe Wright's The Woman in the Window, but that is the way these things work. That is without mentioning the long list of blockbusters that won't appear here-including Glass, Shazam!, Captain Marvel, John Wick: Chapter 3, The Lion King, and the Jumanji: Welcome to the Jungle sequel-as I'm certainly excited to see what each of those deliver, but am not anticipating any with the fervor my top ten bring. Some of these certainly lie right outside the top ten while others-such as Dumbo, Aladdin, X-Men: Dark Phoenix, and Frozen 2-that feel important solely for their bigness and not necessarily because I'm personally looking forward to what any of them hold in store for us. Sure, I'll see all of those and am curious about the reactions most will garner (especially Phoenix), but if I wanted to highlight films I'm genuinely excited to see that might not be in the mainstream conversation would have been to include titles such as James Gray's Ad Astra starring Brad Pitt and Tommy Lee Jones about an astronaut who travels to the outer edges of the solar system to find his missing father and unravel a mystery that threatens the survival of our planet. Umm...yes please! That sounds fantastic! There's also Marielle Heller's Fred Rogers biopic starring Tom Hanks now officially titled A Beautiful Day in the Neighborhood, Hereditary director Ari Aster's follow-up to his breakout debut with Midsommar, Harmony Korine's made-for-McConaughey movie The Beach Bum, Greta Gerwig's Little Women and Elizabeth Banks' Charlie's Angels re-makes, as well as writer Andrea Berloff's (Straight Outta Compoton) directorial debut in The Kitchen, and a pair of Are You Afraid of the Dark? and Scary Stories to Tell in the Dark adaptations I'm equally intrigued by. 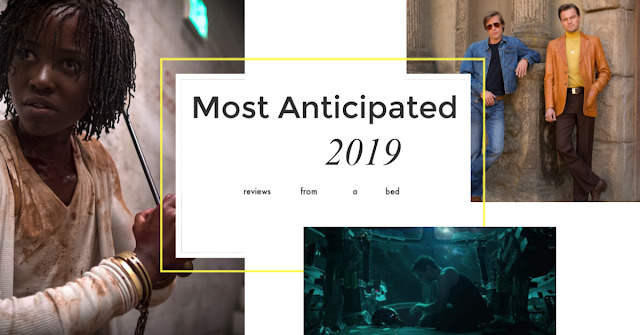 There are plenty others of course, but there just isn't enough space in the world for everything that sounds promising in 2019 and so, here are ten I definitely can't wait to watch and know that I'll definitely be seeing this calendar year.